Releasing his latest research findings at the Indus Research Centre of the Roja Muthaih Research Library in Chennai this month, veteran epigraphist Iravatham Mahadevan concluded that the language of the Indus Civilisation was an early form of Dravidian. Due to the migration of a section of the Indus population southwards, forming some settlements in South India, the Indus Dravidian influenced the South Dravidian languages. The earliest attestations of such influence are found in Old Tamil. As the Vedic Age succeeded the Indus Civilisation, the Rig Veda itself is a product of the composite culture, he said in the paper, “Dravidian Proof of the Indus Script via the Rig Veda: A Case Study,” published as November 2014 bulletin of the Research Centre. Decipherment of the Indus Script eludes scholars ever since the Indus Civilisation was unearthed, as diachronic factors such as those which facilitated the objective decipherment of Egyptian hieroglyphs or Sumerian cuneiform are unavailable in the case of the Indus Script. Hence, scholars are left with the option of beginning the decipherment primarily through synchronic or structural methods deployed to the text alone, in breaking the code and understanding the Indus Language. 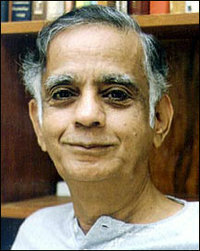 Mahadevan was working in this line since 1968, resulting in his compilation, “The Indus Script: Texts, Concordance and Tables,” published by the Archaeological Survey of India in 1977. 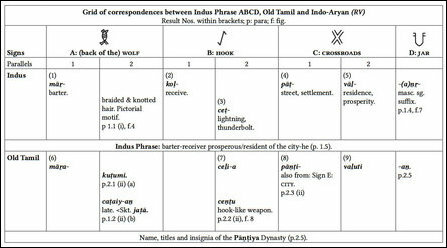 After finding certain patterns in the relative placement of signs in the Indus texts, Mahadevan in the present research approaches the language question by considering the Script as rebus and by coming out with bi-lingual explanations. Rebus was a technique employed in designing ancient pictograms. To explain it in English through an example, an eye could be drawn to read and mean I.
Rebus is usually language-specific and hence helps language identification and phonetic decipherment. Taking the case study of a four-sign phrase that often comes in the Indus seals, and reading the meaning of it as ‘Merchant of the City’, Mahadevan explains the rebus in it through old Tamil and Rig Vedic Sanskrit. Citing the titles of the Pandyan rulers found in old Tamil and the attributes of a deity called Pooshan found in Rig Veda tallying with the rebus, Mahadevan says that they are later survivals of the ‘Merchant of the City’ concept of the Indus Civilisation times. 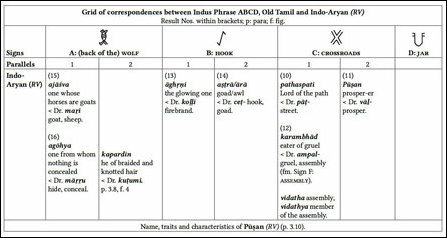 Coming to the language part of the four-sign phrase, Mahadevan citing etymological evidence says that the Indus language survived in old Tamil, while it became loan translation in Rig Vedic Sanskrit. “The present paper appears to me to be the most productive I have so far written,” says Mahadevan who is now 84 and has internationally been recognized for breaking the code of Tamil Brahmi in the late 1960s.